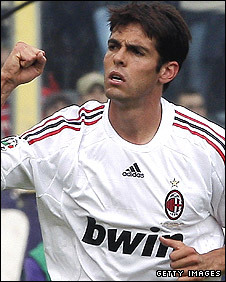 AC Milan owner Silvio Berlusconi says Brazilian playmaker Kaka's future will be decided on Monday. The 27-year-old Kaka has been linked with a move to Real Madrid in a £56m transfer deal following Florentino Perez's return as president. Chelsea have also been linked with the Brazilian playmaker, though the London club insisted reports of a £73.5m offer for Kaka were "totally untrue". "We've never made an offer to AC Milan for Kaka," said a Chelsea statement. "As a consequence we have not discussed a salary with the player either. Any reports to the contrary are totally untrue," added the Blues statement. It had been claimed that Kaka's father and agent Bosco Leite had already sealed the deal in Madrid, with Italian Prime Minister Berlusconi admitting the player may move because "they have offered him so much money". How good a player is Kaka? The proposed £56m fee would be a world record in pounds sterling but not euros, because the exchange rate is different to when Zinedine Zidane moved to Real for £45.6m in 2001. As well as the player's father, AC Milan vice-president Adriano Galliani was also in Madrid, although the Italian club insisted that was because he had been invited to a dinner for the election of Perez as Real's new president. "AC Milan and Real reckon they have the basis for a deal," Spanish football expert Sid Lowe told BBC Radio 5 Live. "But there are things in the way, like the commission to be paid to Kaka's father, and with the European elections coming up on Thursday, Berlusconi will not want to lose him just now." Earlier this year, Kaka rejected a £100m transfer and a reported wage offer of £500,000-a-week to go to Manchester City and in an interview on Tuesday the Brazilian told Gazzetta dello Sport he wanted to stay with the Serie A club. In January, Berlusconi admitted the scale of City's offer made it difficult for Milan to keep hold of the Brazilian. Returning Real president Perez was previously in charge of the Spanish club from 2000 to 2006, during the famous Galacticos era that resulted in the spending of large fees to bring the likes of Ronaldo, David Beckham, Luis Figo and Zidane to the club. Perez's comeback is on the back of a pledge to relaunch another Galacticos era, with Kaka known to be one of his chief targets. When former AC Milan manager Carlo Ancelotti was confirmed as the new Chelsea manager on Monday he was immediately linked with Kaka as part of reported ambitious spending plans of his own, which are also thought to include the playmaker's Milan team-mate Alexandre Pato. The 49-year-old Ancelotti, who officially takes over at Stamford Bridge on 1 July, hinted at a potential move, and stated: "There is one player I would like to sign but I cannot take him with me." Kaka, who joined Milan from Sao Paolo in September 2003, has reportedly signed a five-year deal with Real for a salary worth £7m a year. Galliani reiterated recently that Milan might find it difficult to turn down offers for their prize Brazilian assets. "We have had requests for Kaka and Pato from two of Europe's biggest clubs and we will try and resist but there is an uneven playing field," he stated. How did Kaka slip from Man City's grasp?